In addition to the previous language sites I have designed, I decided today to go ahead and launch another one that is a work-in-progress. 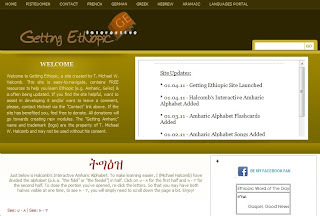 As the title of this post reveals, the site's name is "Getting Ethiopic". Right now, I have included media on the site that will assist folks in learning the Amharic Fidel / Feedel. Given that the Fidel is so intimidating and overwhelming, I felt this the necessary first step. I have included readings, videos, songs, interactive modules and more, to assist those wanting to begin learning Ethiopic languages. While most of the materials currently on the site focus on Amharic (modern Ethiopic), these resources will also assist folks in learning Ge'ez (classical Ethiopic). Given that this is an incredibly busy season in life for me, I'm not sure how often within the next couple of months I will get to add data to the site, which is another reason I chose to go ahead and launch it (no need to have it just being dormant). However, if/when I get the opportunity, I will update it. Anyway, head on over to Getting Ethiopic. Then, when you're done, check out my Getting Theological Languages portal and my other language sites: Getting Greek, Getting Hebrew, Getting Aramaic, Getting (Theological) German and Getting (Theological) French.